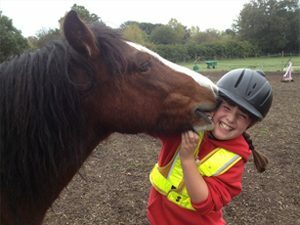 Riding courses for children, as good as having your own Pony! 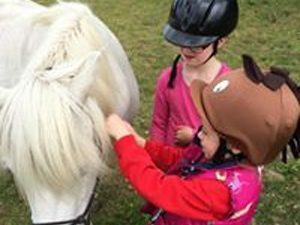 Our Pony Experiences are the perfect way to come and find out how you child feels about being around ponies before committing to a full course. 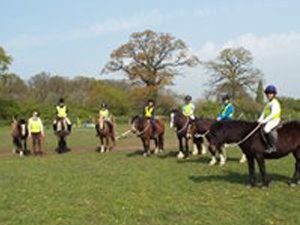 They also give you, as parents and guardians, the chance to get a feel for what The Pony Academy is all about. During the experience, children will help us fetch, groom and get the pony ready for the ride. After their ride around the field, they will help put the pony away, too. 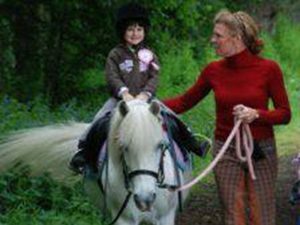 Pony Experiences are a wonderful Birthday Treat for little ones! Let us know it is a birthday treat before hand and we will organize a special Rosette to commemorate the occassion. We also provide Gift Certificates – perfect gift to send to that precious little someone in your life! * Note: These experiences are payable upon booking and are non-refundable. If you are able to give us 48 hours notice, we will be happy to reschedule if necessary. This course is for first timers, beginners and children that have had a few lessons but no experience grooming and tacking up their ponies. It runs for 4 to 7 weeks (depending on the School Calendar) and is the perfect way to get ready to join to our Group Lessons. During this course, children learn how to read and handle their pony, lead it and tie it up, groom it, tack it up, get on safely. They also learn the basics of balance and steering. Cost: £240 per child for the 6 week course, with an Early Bird Price of £210 if paid before the course starts. Each session lasts 90 minutes. Groups of 4 to 7 children maximum. Once your child has completed an Intro Course they will be ready to join one of our group lessons. Here they will be supported (have a helper and be on the lead) as much or as little as they need, with the emphasis being on getting them as independent as possible, as soon as possible! During these lessons, we teach the children horsemanship and riding (we believe one goes hand in hand with the other). The courses tie in with the School Calendar (usually last 6 weeks) and are held on Saturdays and Sundays. Cost: £240 per child for the 6 week course, with an Early Bird Price of £210 if paid before the course starts. Lessons are 90 minutes long. Groups of 4 to 7 children maximum. After a few months, the children will invariably start to develop a special relationship with a particular pony. When this happens, and they can walk and trot off the lead rein, we invite them to become Pony Sharers. That means that they come to be with “their” pony every time they come, spend two hours a week with their pony and are invited to take part in extra Special Sharer Activities. Pony Sharing also means a different level of commitment to your pony. Please get in touch if you would like more information on Pony Sharing. Cost: £150 per calendar month.